Last week's Augmented World Expo felt like a distant memory by this Monday, as Apple unveiled ARKit 2.0 at its annual Worldwide Developers Conference. Certainly, this news would overshadow anything augmented reality this week as it nearly eclipsed AWE when early reports leaked of the toolkit's new superpowers. Not so fast, said Magic Leap. The company brought the tech world to the edge of its seat on Wednesday with the closest public look at the Magic Leap One yet. Meanwhile, an intriguing underdog has emerged with a headset that appears ready to arrive before Magic Leap One, which Magic Leap promises will ship this year. On Wednesday, June 6, the people at Magic Leap finally (FINALLY) decided to give the public a dedicated, slow, feature-by-feature walkthrough of the Magic Leap One: Creator Edition. How was it? About as good as it gets without actually getting to see what images look like through the device when wearing it. Host Alan Noon, Magic Leap's senior learning resources technical artist, was joined by Shanna De Iuliis from the company's technical marketing team, for the second installment of the company's Twitch series. Apparently, when you talk to people who smirk knowingly and talk about how they've tried Magic Leap but can't talk about it, De Iuliis is one of the people they've met but can't talk about. REALITY BITES: Magic Leap is notable among augmented reality companies for the massive amount of investment dollars it has garnered. But it isn't the only company worth backing. Here's why one startup thinks investors should put their money into AR. As expected, Apple revealed at the WWDC keynote on Monday that ARKit 2.0 will support multiplayer gaming support and persistent content, which will arrive this fall with iOS 12. In addition to persistent and shared experiences, ARKit 2.0 will bring improved face tracking, more realistic rendering, and 3D object detection. Shared experiences will enable multiplayer support for games and group collaboration for productivity apps. In addition, a spectator mode so that others can watch along from another iOS device. Alongside ARKit 2.0, Apple revealed new Animojis characters as well as new Memoji virtual doppelgangers that compete with functionality quite similar to that of Samsung's AR Emoji. REALITY BITES: Not everyone is impressed with ARKit 2.0. Nick Robinson, the co-founder and CEO of VR startup RLTY CHK and former chief marketing officer for CPG Quest Nutrition, dismisses Apple's mobile AR toolkit as an illusion. Just a year after facing trade secret theft allegations from his former employer, ex-Meta Company employee Kevin Zhong and his new company are ready to ship the product that triggered the lawsuit. 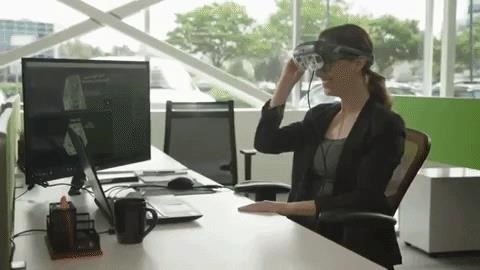 Starting Wednesday, interested parties can order the DreamGlass AR headset from Dreamworld's website for $399, with the first batch of devices expected to ship to developers by the end of June. Learn more about the specs of DreamGlass AR and how it compares to the Meta 2. REALITY BITES: Just as smartphone operating systems differ from their desktop counterparts, AR headsets will require their own operating systems. Ben Ferns, former chief technology officers at Plattar & Metaverse Makeovers, explores what that entails.